Grilled Peaches - Easy as Pie! Grilled Peaches – Just Like Pie! I have always wanted to try grilled peaches. When I saw fresh peaches at the store for .69/lb, I decided it was time to go for it. I am so glad I did. Grilling peaches with sugar on top turns them into something special. The heat caramelizes the sugar and softens the peaches, turning them into little bowls of peach pie filling. The best part is, you don’t have to heat up your house. Serve them warm with vanilla ice cream and you have an ﻿﻿exceptional dessert. Serve them dolloped with yogurt and granola and you have a brilliant breakfast. Brush all sides of the peaches with the oil and place in a large bowl. Add the sugar mixture to the peaches and gently toss until peaches are coated. Let sit at room temperature for 20-60 minutes. Cook cut side down on a hot grill for 5 minutes or until the peach has pretty grill marks. Turn the peaches over and grill on medium high for 10-15 minutes or until the fruit is tender. Top with more sugar and cinnamon if desired. You may also enjoy Honey Sweetened Refrigerator Pickles and Banana Chocolate Chip Muffins. Love. Love. Love. We just tried grilled peaches for the first time this summer and I fell in love with them. They truly do taste like pie. Your grilled peaches look fantastic! I can’t wait to try grilling peaches. Thanks for sharing your recipe with The Hearth and Soul Hop. I just looove grilled peaches. I put brown sugar and cinnamon on mine. Thanks for reminding me it’s time to do this again! Just doin’ my job! 🙂 Thanks for stopping by and taking the time to leave a comment. Well yum is all I can say. Those peaches look fantastic. Great picture! Come over and visit us. We would love to have you. We have some wonderful Southern recipes this week. Oh wow! That sounds soooo good! I would love to try this. I hope you do try them! Thanks for stopping by Denise. And thanks for leaving a comment. Summer. Perfectly captured Summer. Thank you for sharing. I repinned to Pinterest to be sure that I remember to make these. Thanks Tricia! I really need to remember to do that more. It is a really neat reasource. Oh yum. Now I know what I am going to do with this box of peaches I just bought! Thanks for sharing! I hope you enjoy. Thanks for stopping by and leaving a comment. These look and sound amazing!! This is reason #453 for me to go buy a grill!! I thought everybody had a grill! These look really great. I like the simplicity of it. Great! I’ll check it out. YUM! Oh and I am picking Peaches this weekend! Wahoo!!! Thanks so much for linking up to “Made it on Monday”! I’ve always grilled peaches with maple syrup and orange juice, it’s nice to have another option to try. This looks good. Grilled peaches are the best and are just coming into season in the Northwest. That sounds wonderful! I’ll have to try that next. Thank you so much for sharing! Thanks. I’ll check these out. Of all the different things I’ve eaten in my life I can’t believe I’ve never had grilled peaches. They look amazing!!! Thanks so much for sharing at the hearth and soul hop. Oh, wow, these look amazing! I’m going to have to try grilling some fruit. Yum! I love grilled peaches! My husband made these this summer and we fell in love! They taste really good with a big scoop of frozen yogurt too! You are right grilled peaches are just like pie. 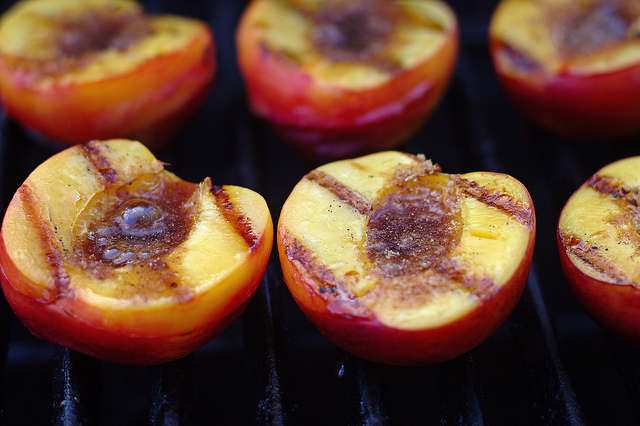 We just love to grill peaches and your peaches look awesome! Hope you are going to have a wonderful week end and thanks for sharing with Full Plate Thursday! Oh my goodness, I have never grilled fruit, but these peaches look so delicious! What a nice breakfast. Thanks for linking to Fat Camp Friday, see you next week! Thanks so much for sharing with Momtrends for our Friday Food Linky. We must try this for dessert this summer. Have a great weekend. I have about 50 million peaches that I am trying to find recipes for, so I will have to try this out. It looks lovely. haven’t tried this yet 🙂 this is a must-try! These look delicious! We just switched to a paleo diet, and have been needing desserts. These would rock! I thought I sent you an email when the trackback came through. Thanks so much for featuring my recipe. I really, really appreciate it! Thanks Jen! Those dressed are adorable! I have never heard of grilling peaches, but these certainly do sound delicilous.I will have to try them. These look delicious. I am definitely going to have to make this for dessert next time we grill out. The photo is also beautiful. I would love it if you would stop by and share this at the crafty link party going on right now at Lines Across My Face. Looks yummy! I love peaches! Thanks for linking up! They look so delicious. I wonder if I can do this with nectarines since I have a full fridge of them right now…. Thank you so much for sharing this at Foodie Wednesday. hope to see you there this week as well. This looks delicious. I just got more peaches today and will have to give this a try. Nancy, I love this. Featured you on Domestically Divine. Thanks for all you do. THANK YOU so much for sharing your recipe with me at Cast Party Wednesday. I’d like to invite you back this week. You are featured on Full Plate Thursday this week. Enjoy your Red Plate and have a great week! Thanks again Miz Helen! Love your blog! New subscriber following from foodie mama hop. Got to it late so finally here. This recipe is lovely. I have never done peaches on the grill but have always wanted to. Thanks for sharing this. Welcome Kim! I am behind myself!